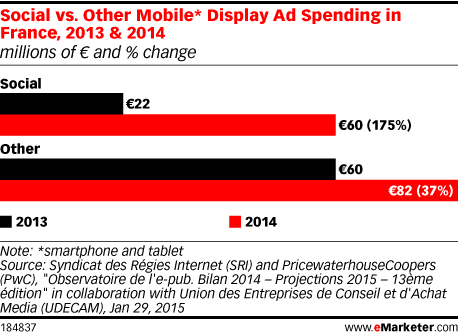 Data is from the January 2015 Syndicat des Régies Internet (SRI) and PricewaterhouseCoopers (PwC) report titled "Observatoire de l'e-pub. Bilan 2014 – Projections 2015 – 13ème édition" in collaboration with Union des Entreprises de Conseil et d'Achat Media (UDECAM). Members of SRI and UDECAM were surveyed on their investments in the different segments of digital advertising. Additionally, PwC interviewed 35 industry professionals face-to-face on market trends and outlooks. Other sources used included financial results, PwC internal data and publications by trade associations.